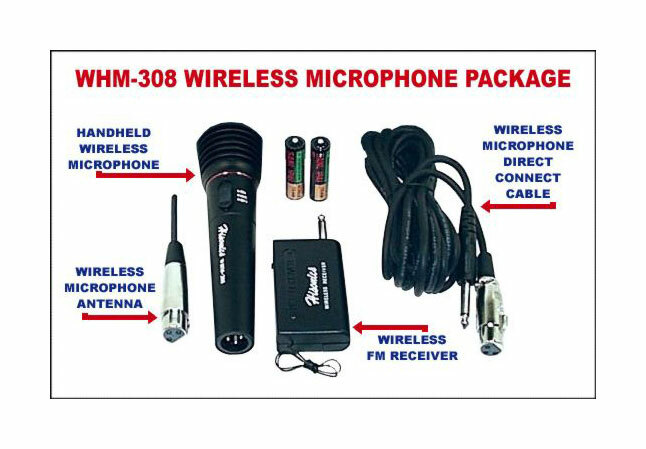 This excellent wireless microphone system comes with a Handheld Microphone that can transmit around 300 feet to the included mini FM receiver (that plugs into a PA system) in the VHF frequency range of around 114 MHz. The receiver has an on / off switch and a fine tuning frequency control. The frequency response is 100 to 10,000 Hz and the impedance is 600 ohms. 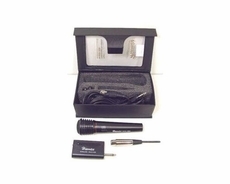 Output Level: 10MW S/N Ratio: 75dB Modulation: FM Maximum Deviation: 30KHz Battery Powered: 9V.